A slow cooker is a busy mom’s best friend! My navy bean soup recipe make a delicious, filling meal that’s easy to prepare using simple ingredients. I love a good soup recipe during the cold winter months. Fortunately my whole family loves soup, so we’re always trying new soup recipes. 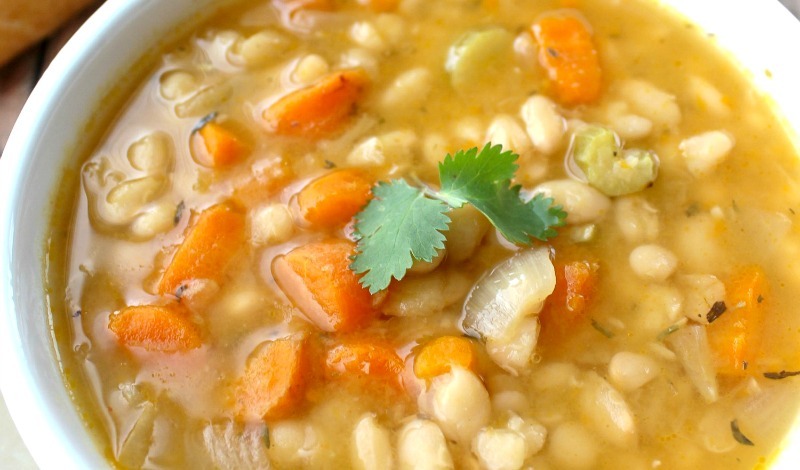 This slow cooker navy bean soup recipe is quick and easy to make. It’s filling too so it makes a great meal. All you need is a few simple ingredients and you’ll be able to whip up this navy bean soup recipe. I love using my slow cooker for soups because I can either prep everything the night before and just turn it on in the morning or I can toss things in throughout the day when I have spare time. The slow cooker is a busy mom’s best friend! Although my Instant Pot is very quickly becoming a bestie too. If you’re looking for a delicious, slow cooker navy bean soup recipe using simple real food ingredients, give this one a try. Your family will love it! 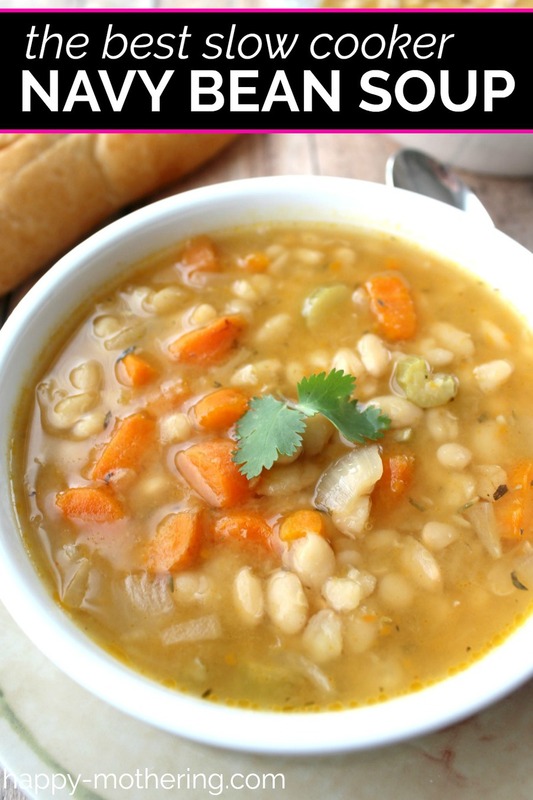 This Slow Cooker Navy Bean Soup recipe is the perfect dinner for cold winter nights! Start off by adding Navy Beans to a large stockpot and boil for 10 minutes. While the navy beans are boiling, mince the garlic, dice the onion, slice the celery and slice the carrots into thin rounds. Add the olive oil, garlic, onion, celery, and carrots to a large slow cooker. Drain your beans and sort through the beans and remove any debris or stones. Give them a quick rinse and then add them to the slow cooker, along with the bay leaf, rosemary, thyme, paprika and some freshly cracked pepper. Add six cups of chicken stock to the slow cooker stir carefully to combine the ingredients. Place the lid on the slow cooker and cook for 8 hours on low or on high for 4-5 hours. After 8 hours, stir the soup and mash the beans slightly to thicken up the soup to your desired consistency. You'll want to add some sea salt before serving to make the flavors pop. Starting with ½ teaspoon, add salt to your taste. I used about 1 teaspoon total, but keep tasting and adding more, ½ teaspoon at a time, until it reaches the level that you prefer. 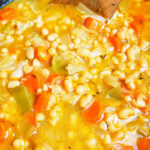 Does your family like navy bean soup? Have you ever made it in a slow cooker? This sounds yummy! I just made a big batch of homemade chicken broth over the weekend. Now I know what I am going to make with it. Thanks for sharing! Homemade chicken broth is the best! I’ve never tried navy bean soup. But yum it feels good! This looks delicious! Our family loves soups and will be trying this. Pinned. Thanks for sharing on Merry Monday. What a delicious looking soup- this is perfect for a chilly day like today! This really looks delicious. I love navy beans and this is such a healthy dish. We love rich and savory soups at our home too. I am always searching for ways to eat healthy as well. Looks amazing, pinning it too. We would love for you to link this recipe up at Thoughts Of Home On Thursday! This looks delicious! I am trying to find more soups that the kids will eat – I think they will like this one. Thanks for sharing this recipe. I put it together this morning and it smells heavenly-can’t wait to eat it! My husband loves soup and this one is also healthy-good for all! Tried this recipe. Loved it. Hubby loved it too!! A keeper!!! If you don’t like rosemary, feel free to omit it. How did it ruin your soup? Will be trying this tomorrow with a vegetable based broth to make it vegetarian. Looks delicious! Made this today and the whole house is smelling good! I also added ham to mine but it would be good without as well. Thanks for the recipe! This was not good. Tasteless and just… boring. I won’t be making this again. Smells good. Some of the beans turned out hard. Next time with boil it longer before putting in slow cooker. I made this but soaked the beans overnight and added a meaty ham shank. It is SO yummy! You have got to try this! I cooked mine on high for 5 hrs and it was perfect! :) Thanks! Has anyone tried using canned navy beans to save some prep time? Thank you so much for this recipe! It’s wonderful! For those with an Instant Pot, I soaked the beans overnight and then pressure cooked the soup instead of slow cooked. I cooked it for 40 minutes and did a natural release. I omitted the rosemary and used a full tbsp of salt while the soup was cooking. I loved it and can’t wait to make it again! Just completed this recipe, and it’s very good. I think it would’ve been better if I’d used all chicken broth instead of mostly water (what I had on hand), and a ham bone rather than just a ham steak, but I’m not detracting any stars for my own changes. The beans are perfectly tender. I used smoked salt in addition to the smoked paprika. Great hearty soup for a cold evening! Why the olive oil? Are we sautéing first!? This turned out wonderful! I try to makes soups once a week since they are a good way to incorporate healthy food in my family’s diet. Usually when I make new recipes I need to change things but this only required one change on my part. Since I do not like rosemary/thyme, I replaced all the seasonings in recipe with… 1 tsp dried Italian seasoning, 2 tsp dried parsley. Worked great. The liquid measurements and cook time of 5 hours on high were perfect. Thanks for the recipe. This was amazing! Loved the flavors and how they married. I am expecting in a few months so will be making more batches for sure. So easy and HEALTHY. Thank you so much. I’ve been making this soup for two years. Can’t imagine why anyone wouldn’t like it. It’s easy to prepare and tastes good, especially when you add smoked paprika. I’m so glad it’s become one of your favorites Pat! I have modified it according to what I have on hand. I used the trinity and added bay, Italian seasoning, parsley, and about 4 oz. of chopped lean ham. 1 can of broth, pepper and salt. Smells incredible and look forward to having the finished product. I may add mashed potato to the end. Why would you sort through your beans after boiling, I always do what my great-grandmother taught me and that is to sort and remove the bad stuff before putting them in the pot to soak over night. I never thought about making bean soup in the crock pot, but planning on it the next time. Your recipe is almost like the one I use from my great-grandmother which everyone loves. So no problem just following yours and leaving out the stuff she never used. I’ve made this several times using it as a base for the Cuban soup ajiaco, for which I bought a frozen Goya blend of veggies. Delish! Made this last week but used 4 cans of beans. It was good. 2nd night sliced up and browned some kielbasa and into the pot. Even better. Trying andouille next time.